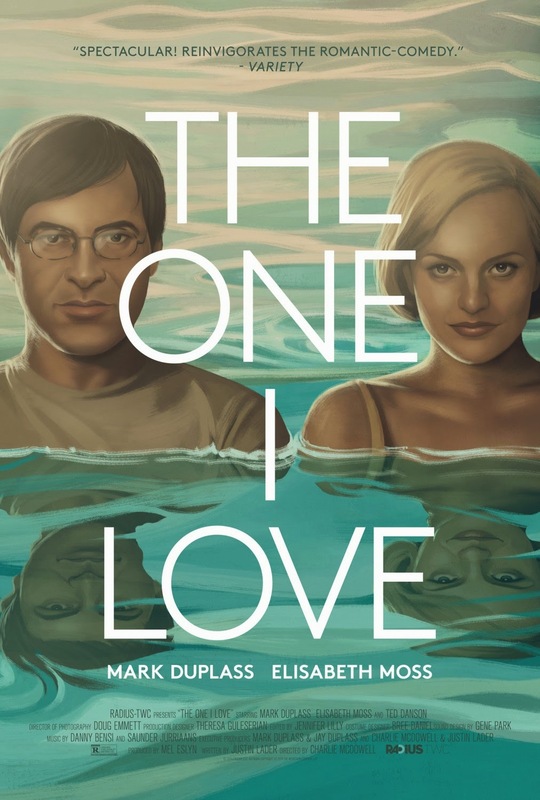 Movie: "The One I Love"
A married couple, Ethan (Mark Duplass) and Sophie (Elisabeth Moss), are having troubles in their relationship. They are seeing a therapist (Ted Danson) who recommends a weekend retreat to a house in the country as part of their treatment. There is more than meets the eye to this getaway as the property has some little quirks, like the guest house having an exact double of each of them, that could wind up making or breaking their relationship. We had heard a lot of good things about this film when it came out in 2014, so when we saw it was on Netflix's instant streaming service, I was certainly excited to watch. This is a strange kind of dark romantic-but-not-really-romantic comedy with a sci-fi twist. Kooky, huh? Though it should be commended for its attempt to pursue such an original take on an old concept, it's that old concept that we just didn't connect to very much. The trailer for this film is very secretive about what exactly this film is about, apart from the romantic element involved. We obviously don't think it's that necessary to hide the basic concept of the story as we don't think it hurts the overall enjoyment of the film as this element is the best thing about it. The movie focuses on a married couple at a bad point in their marriage. Sophie, played Elisabeth Moss, is bored with her husband Ethan, played by Mark Duplass. Ethan has also been unfaithful in the past and she is trying to overcome her feelings about his infidelity and regain the trust for her husband she obviously and desperately wants back. They are really trying to work things out and think by going away for a weekend to a nice vacation home recommended by there therapist, played by Ted Danson, who is only in the film briefly, this can help them rekindle their dying relationship. At this vacation home, there are doubles of both Sophie and Ethan. These copies of themselves seem like the ideal versions of their significant other, and these doubles only appear when either Ethan or Sophie are alone without the other. Then, they are forced to decide which version of themselves they prefer: the too-perfect copy, or the flawed original. The movie never goes into great detail about who these doppelgangers are or why they look the way they do, but there are obviously some unexplained supernatural elements going on, which we don't necessarily want or care to know about in a case, since this sci-fi twist is what sets it apart from other romantic dramas. The film explores both relationships as a whole and the issue of personhood, and frames it as: what makes your partner your partner? Is it the way they look, how they act, or who they are inside, and what separates each of these characters from their doubles and could you tell the difference? This movie begins on a good, ambitious concept that starts to run out of steam as the movie goes along. It also starts to becomes a little frustrating to watch. Neither Sophie nor Ethan are perfect, and obviously no one is. We all have our faults and our strengths as single humans and as part of a couple, but this movie magnifies their specific problems in an attempt to connect to its audience. Though Elisabeth Moss and Mark Duplass act really well separately and have good chemistry together, something about this movie didn't jive with us. The overreaching at emotional, physical and therapeutic connections is commendable, but in the end, we felt this film was more talk than anything. It's all really weird, and not just the part about cosmic houses and space doubles, either. There are also multiple twists throughout the last half of the film that become less interesting as the movie progresses. Who knows, maybe in 5-10 years, we will find this film again and it will be more appealing then. One year ago, we were watching: "300"